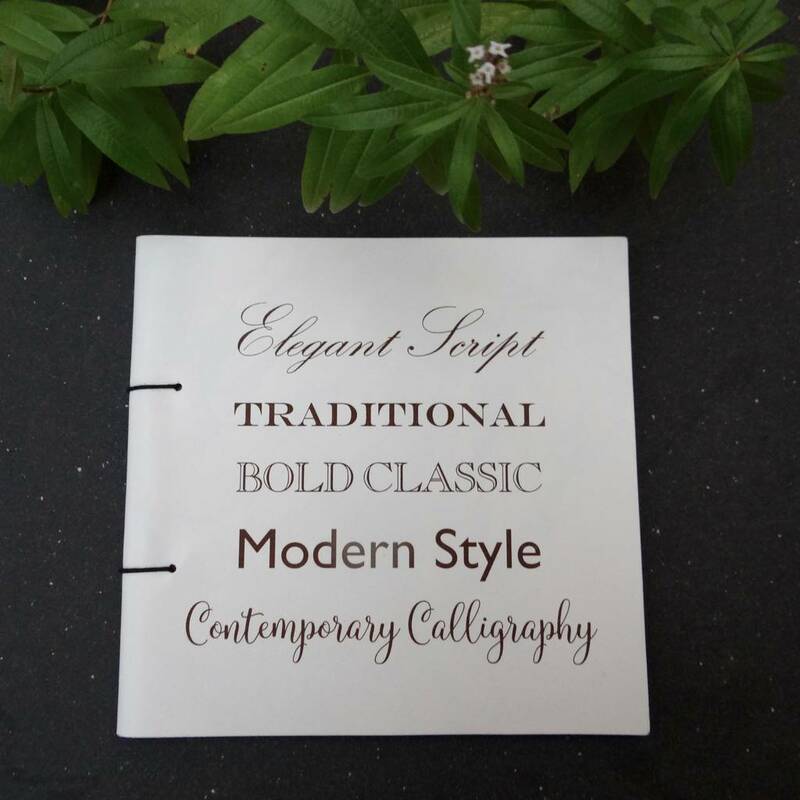 back cover message line 1. only engraved if ordered as option above. confirmation confirmation (required)I'm happy with my selection and have checked that all details are correct! confirmation (required)I'm happy with my selection and have checked that all details are correct! confirmation (required)I'm happy with my selection and have checked that all details are correct! confirmation (required)I'm happy with my selection and have checked that all details are correct! 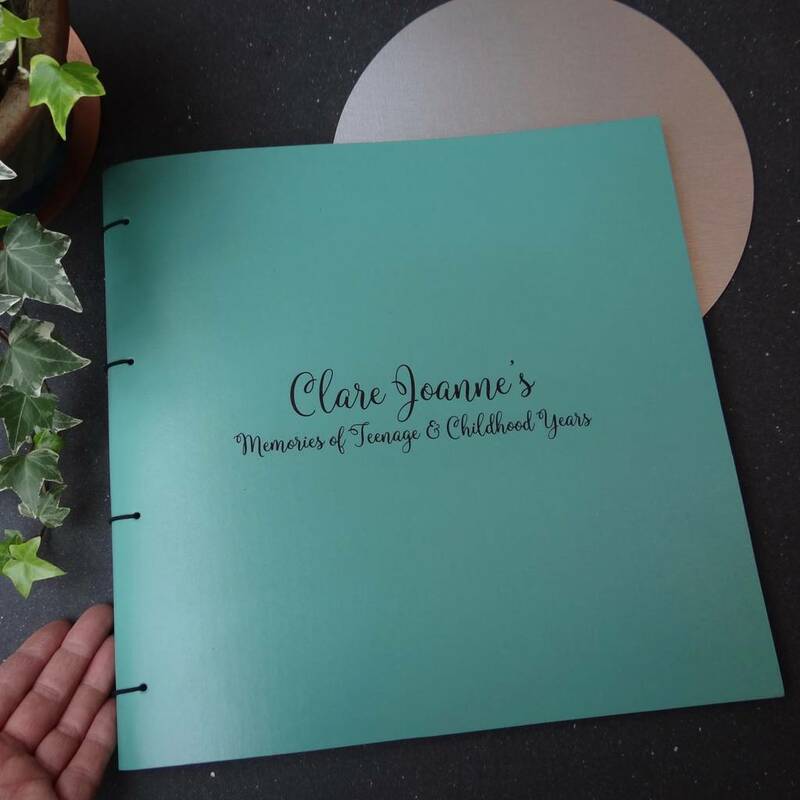 A simply beautiful personalised leather scrapbook to gather together special memories as an original gift to be treasured forever. Artbox leather scrapbooks are well loved by creatives worldwide as a smart combination of traditional and modern design. 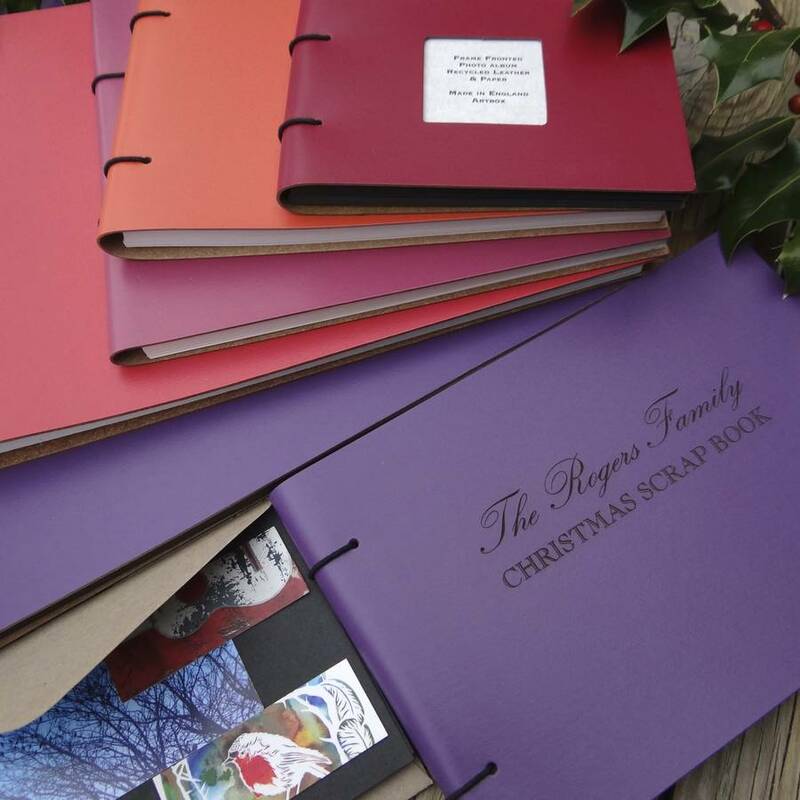 Hand made from recycled leather with love and care in our Sussex studio and refillable thanks to our original binding style and designed to lay completely flat when opened - stylish, functional and very easy to use - our leather scrapbook is a design classic! 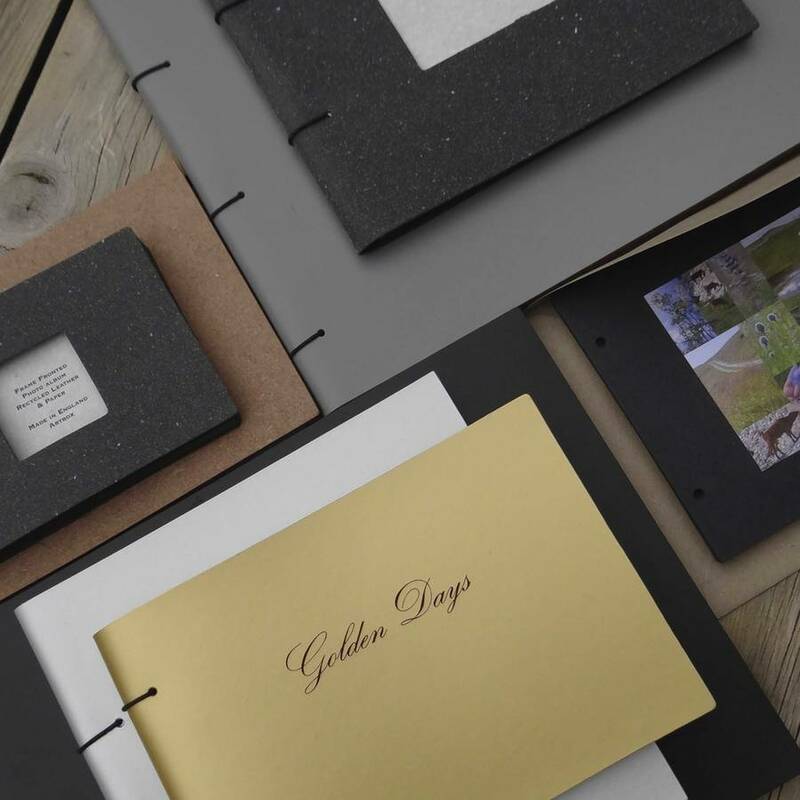 Ideal for gathering together photos, postcards, maps, tickets, menus, cards, envelopes, digital prints, ephemera... to appreciate in future years - a perfect gift to celebrate a special person, place, time, year, holiday or event. Making a memory book or a travel, christmas, wedding, family, baby, home, garden, birthday scrap book is a wonderful creative project; arrange your photos, cards etc.. by date, place, person, event... working out your own story is the fun part... then stick them onto the recycled card pages with glue or sticky back tape/dots or simply punch your own envelopes, cards etc using a standard hole punch, finally... bind all the sheets together in the leather scrapbook to form a living collage of memories. 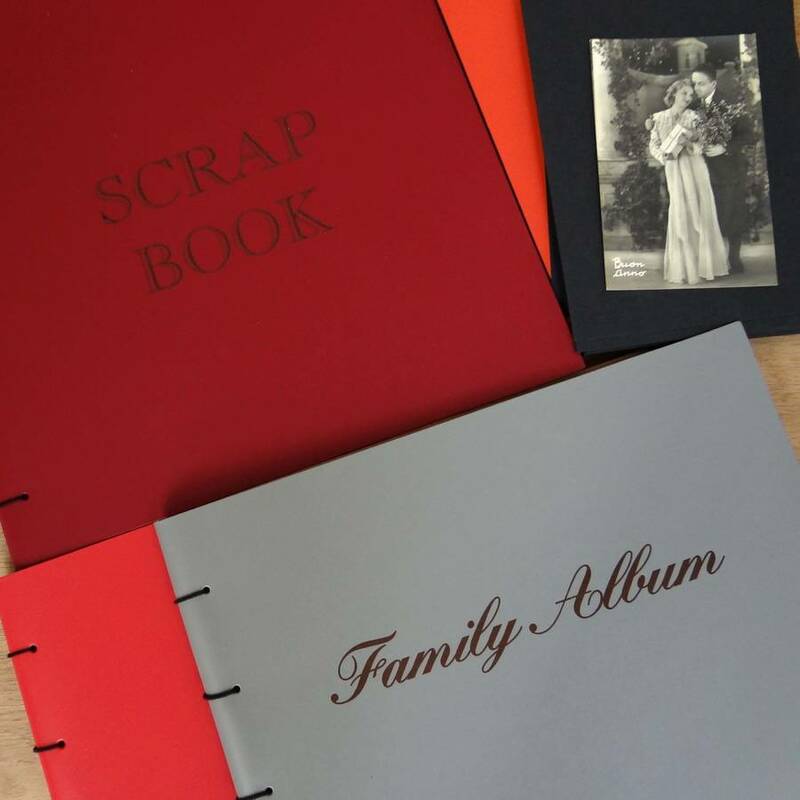 A personalised leather scrapbook can made by engraving a message on the cover: ordering is easy, choose from the following options on the right hand side of the screen: colour and size of book; black or white card inserts; font style and location; type in your message and we’ll make a unique leather scrapbook book for you to transform and treasure forever! 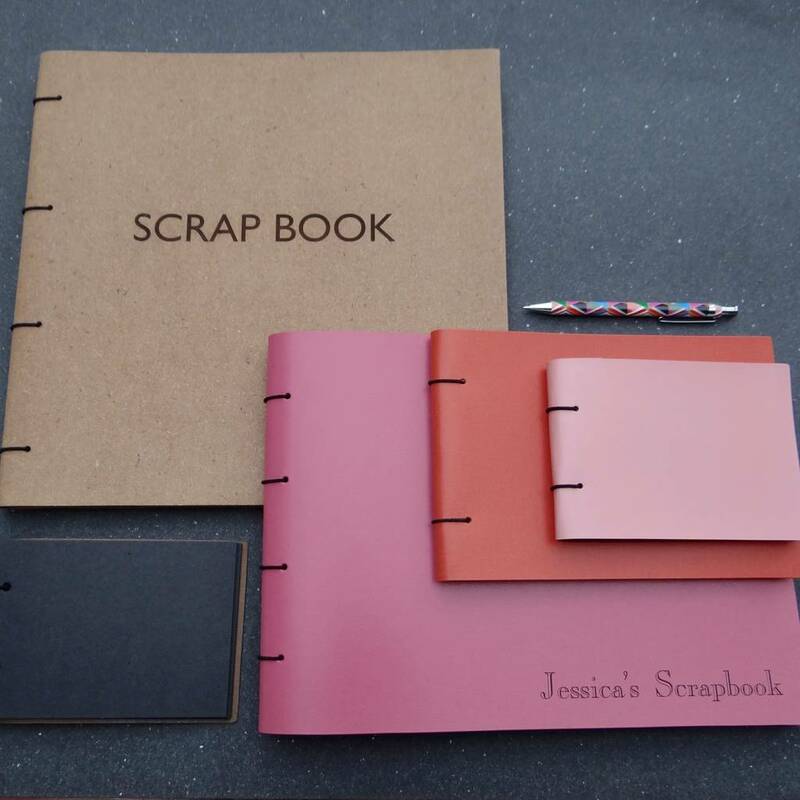 We also make a range of basic leather scrapbooks and journals, these can be found on the Artbox product pages. 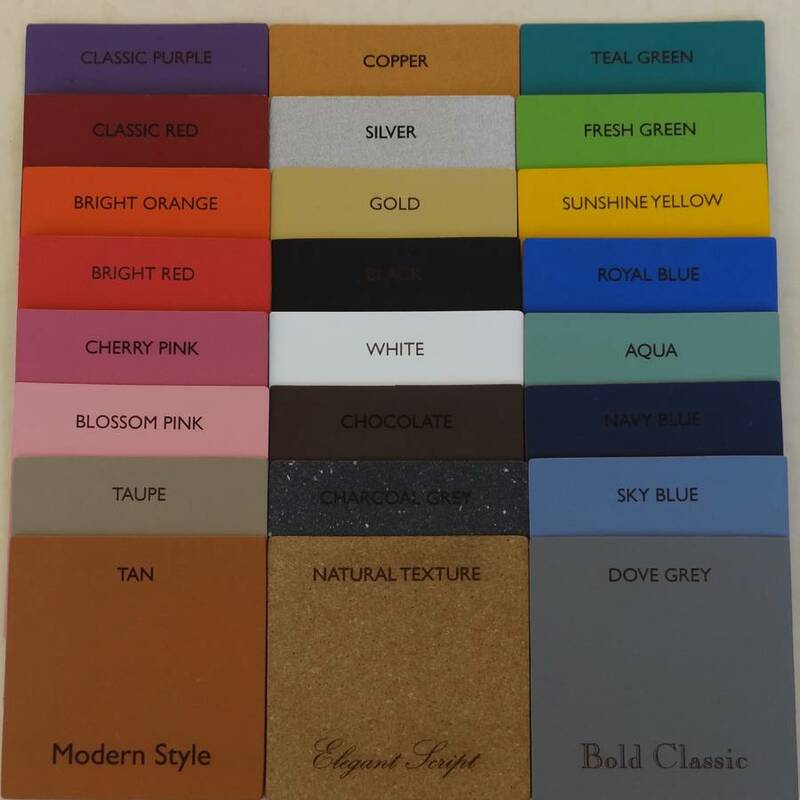 Recycled leather in wonderful range of colours from classic to contemporary, pastel to brights, metallics to natural. 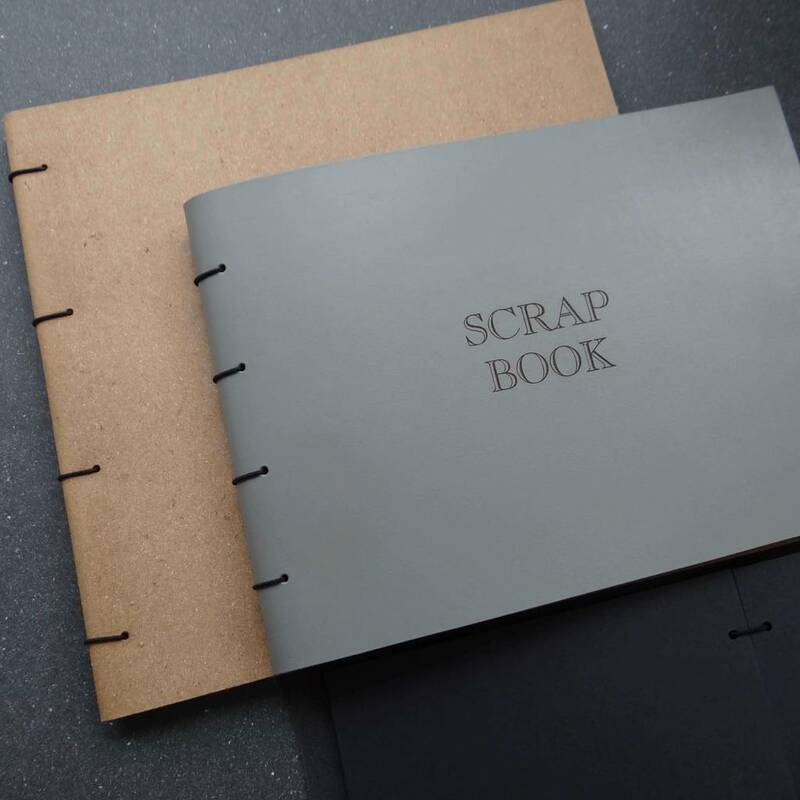 Each leather scrap book contains 30 sheets (60 pages) of black or white 300g recycled card. Please order Refill pages if required. We are happy to bind these if for you. 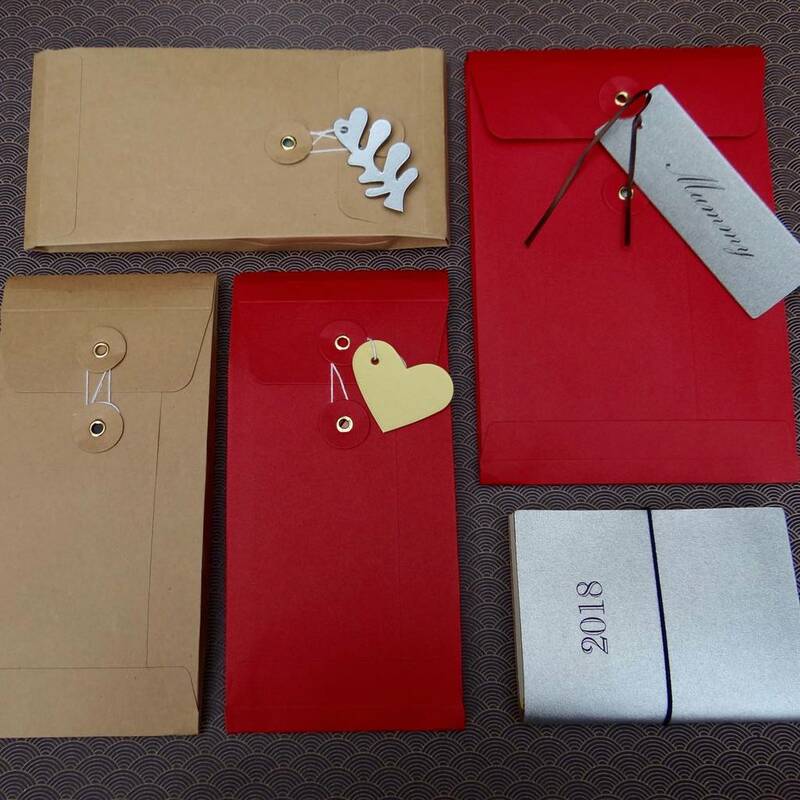 New Gift wrapping: stylish gift envelopes or kraft gift wrap in natural kraft or christmas red with bakers twine and classic leather button tie. Please select this option if you would like us to send direct to the recipient. 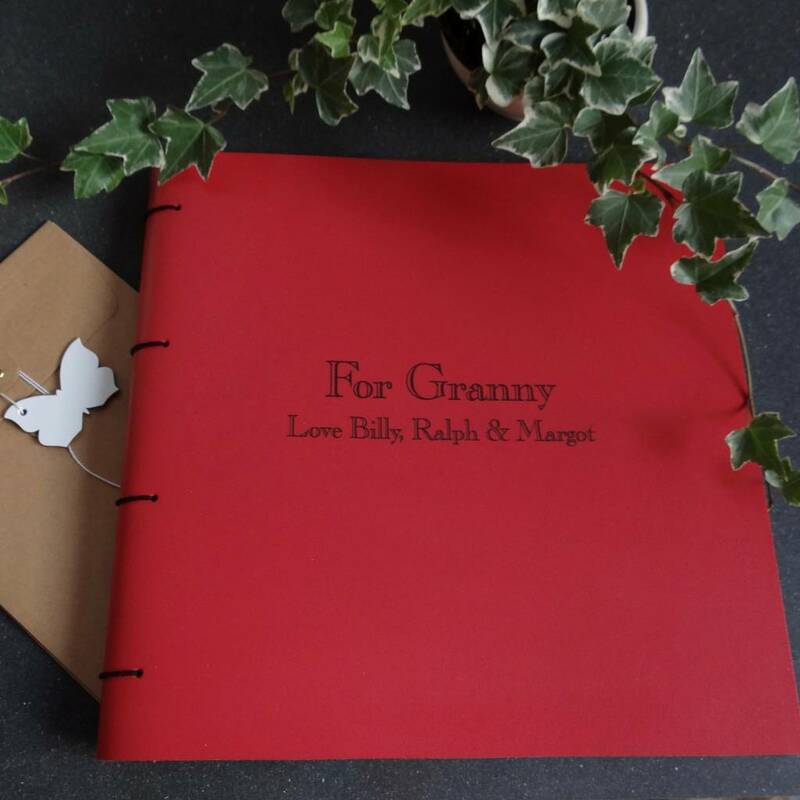 For an extra special gift we can also add a beautiful leather gift tag; the reverse can be written on with most inks and may be reused and treasured as a bookmark! Please elect this option if required. 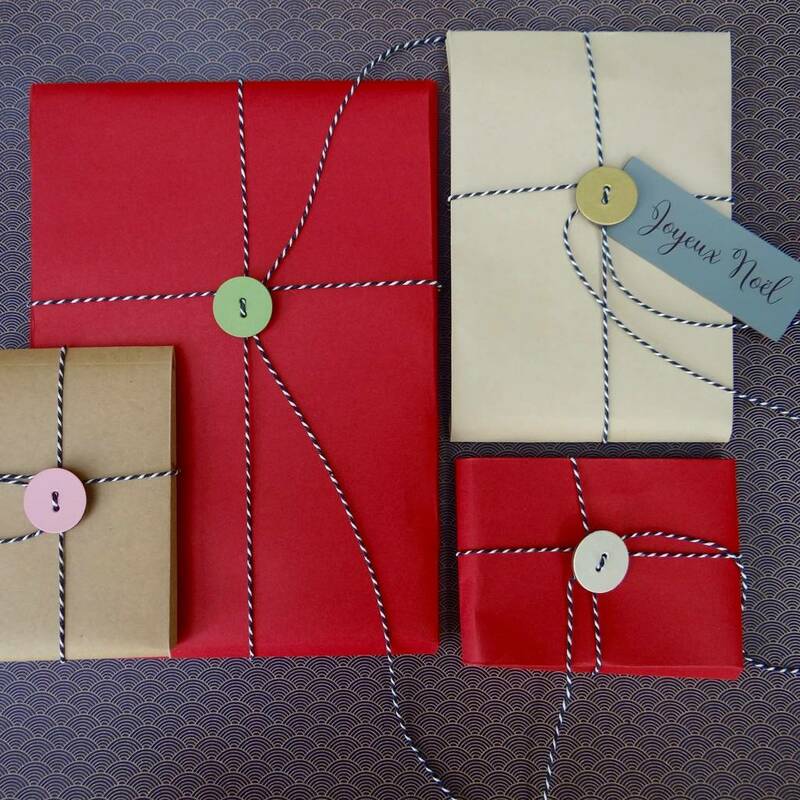 We love gift wrapping and will choose colours that work well with your gift choice but please do let us know if you have any special colour preferences and we’ll do our best to help.